Most comfortable vehicle in tourist passenger Vehicles. Most of the tourist/ visitor prefer to book Tata Winger 9 seater for long tour/ out station tour. Seating capacity is Nine passenger can seat comfortable, all are Push back seats. Other feature are as follow . Tata winger 9 Seater is most convenient and comfortable vehicle in the category of Multi Utility Vehicles. One can book Tata winger 9 seater for family Tour, also can book Winger Long tour with friends for long tour, picnic. chassis made car-like noise, vibration and harshness (NVH) NVH (noise, vibration and harshness) levels, for silent drives. means you enjoy journey like car with winger. Suspension of Tata Winger Front made according to safety and also comfort. Coil Springs and provided to absorb shock at front suspension 9 seater Tata winger. rear suspension is of Double Parabolic Leaf Springs are provided to absorb the shocks by the uneven road conditions in all models of Tata Winger. On the off road you will not boring traveling. All 9 + 1 seat are front-facing, reclining bucket seats that fit the body and also relax the mind and passenger enjoy more journey. Twin doors at rear and swing completely both inside and out, for easy to traveler to keep or remove baggage. The AC of Tata winger come with a Dual AC system for cool, comfortable journey also include features Front AC for faster cooling even in extreme heat outside . And Rear roof Mounted AC with 6 air vents for uniform cooling that can adjustable switch for Roof AC by passengers for low or high cooling of AC. 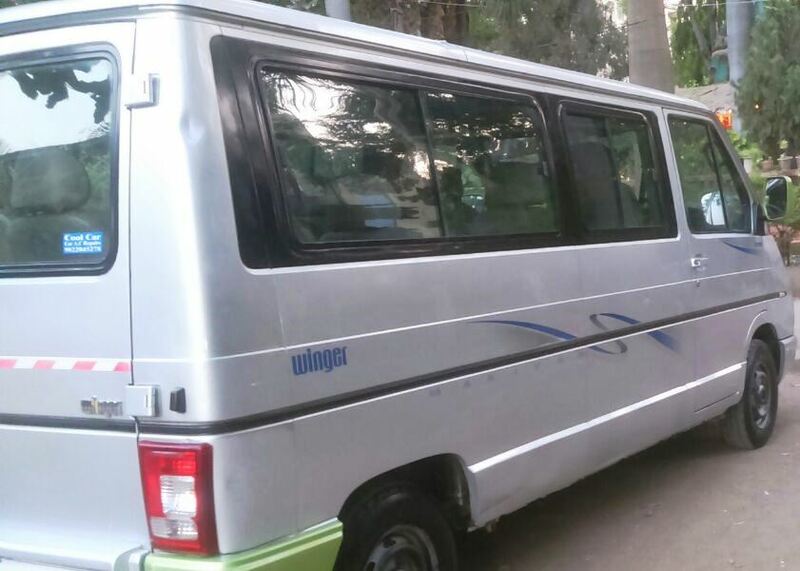 Tata Winger is good vehicle for 9 passenger, for long tour with group, family tour. Excellent Experience of Travel with Tata Winger. We offer Tata winger 9 seater AC on hire in Pune, Mumbai, Aurangabad, Shirdi, you will get best deal on hire Tata Winger. Traveler can book/ hire Tata Winger For Outstation tour from Pune, Mumbai, Aurangabad, Shirdi. or also can book/ hire Tata winger for Local within city.